Intertops Casino is always generous with casino bonuses and this month they're giving away $120,000 in a promotion that will reward not just frequent but occasional players as well. 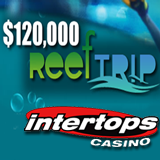 Earn points just by playing and you could be one of the hundreds of players that will receive bonuses up to $800 during the $120,000 Reef Trip leaderboard race. Discover hidden treasure in a tropical reef as you swim your way to the top of the leaderboard for a share of $30,000 in weekly prizes. Check the contest leaderboard for your current rank any time. Every Monday until March 31st, the player that earned the most points the previous week gets an $800 bonus. $700 goes to the second player, $600 to the third and the next seven players each get $500. Every week 250 players get a total of $30,000 in bonuses. Place in the top 15 any week during the month-long Reef Trip and you'll be entered in a draw for a $1,000 Cash Splash grand prize on March 31st. Every Thursday a random draw will award casino bonuses up to $150 to players that have played Monday to Wednesday that week. Intertops offers more than 500 online casino games from Realtime Gaming and Wager Gaming Technology. The deluxe Crystal Waters slot game is bound to be popular with undersea adventurers this month. So will Ocean Dreams with RTG’s Win-Win feature that guarantees players don’t come away from free spin bonus rounds empty handed.